How do I Print to my Printer using Google Cloud Print? You know, it can be a pain to set up your printer on a home network. And sometimes you’re away at the office, but you’d like to print something out on the home printer for later pickup, or for a family member to use. Or how about vice-versa? You’d really like to print something out at the office in advance of your commute. 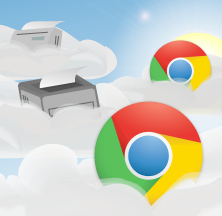 Google Cloud Print is a nifty feature of the Google Chrome web browser that solves all these problems. First, log in to the PC that’s either plugged in directly to the printer or is networked to it, so that it appears as a printer option normally without any action on your part. After that, go through these same steps on any remote PC you’d like. Just use the same Google account, and you’ll see the printer you registered previously. Once Google Cloud Print is enabled on the remote machine, you’ll be able to print to it from anywhere you have Internet. A very handy feature indeed.